I'd seen snippets of Piers Morgan interviews before, but I had never seen a complete hour of his program. Last week, however, my wife and I sat silently for 60 minutes to hear every word of what Morgan later called the most-inspiring interview of his journalistic career. We were deeply moved by it. Rick and Kay Warren shared incredibly personal and intimate details about the tormented life and tragic death of their 27-year-old son, Matthew. Matthew committed suicide in April with a gun he bought illegally on the Internet. He had threatened suicide countless times and had attempted to take his life before. 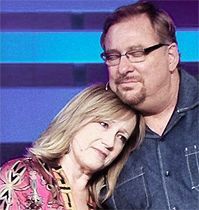 Probably the highest-profile preacher of this generation, Rick Warren humbled himself to speak of a father's love, his family's pain, and the awful aftermath of what bars Catholics from burial in consecrated ground and what some Protestants consider the unpardonable sin. Kay spoke of the morning Matthew's body was found and told how she hugged his lifeless body as officials were carting it away — angrily telling them she would be through when she was through, not at their prompts! That was holy anger from a broken heart. Toward the end of the interview, Rick spoke of trying to find something purposeful in the pain he and his family are going through. Part of the answer he and Kay have embraced is to focus on helping the church understand more about mental illness. To encourage people with mental illness to get past their sense of shame to get help. To use their experience to counsel family members of people with depression, personality disorders, or other mental illnesses. The legal profession has used the label "sickness" to defend thieves, child molesters, and murderers. And, yes, some pulpits have replied by discounting any notion of mental illness as merely a lame excuse for evading accountability. Can't intelligent believers acknowledge the truth lies between those extremes? Bones can break and cripple a person; so can minds and brains. There is no shame in going to an orthopedic specialist to get treatment for a broken bone; there should be no shame in seeking help from a therapist or psychiatrist for mental illness. Just as prayer is a first-line Christian response to either physical or mental pain, so should God's provision of trained professionals, medication, and therapy be first-line responses too. Neither makes the other unnecessary. I respect the Warrens for their courage and thank God for what they tried to do for a wounded child. I pray their example will be of great value to many. God is our merciful Father and the source of all comfort. He comforts us in all our troubles so that we can comfort others. When they are troubled, we will be able to give them the same comfort God has given us (2 Corinthians 1:3-4 NLT). "A Grieving Family's Courage" by Rubel Shelly is licensed under a Creative Commons License. Heartlight encourages you to share this material with others in church bulletins, personal emails, and other non-commercial uses. Please see our Usage Guidelines for more information.